KIA has hit the upgrade button on the 2015 version of its popular small car, the Rio, with the new model sporting a new look and a new pricing structure. The entry-level S, new S Premium and Si models gain a new front and rear bumper design, new grille pattern, new centre fascia and audio unit design, and metallic look highlights while retaining all the safety and convenience features from the outgoing models. The S is available in three and five-door configuration with the proven 1.4-litre MPI engine coupled to a six-speed manual and four-speed automatic. The three-door S is $15,990 for the manual and $17,990 for the automatic. The five-door model is $16,990 for the manual with the automatic an additional $2000. The new S Premium grade is available in five-door with the same drive trains as the S but with additional trim and comfort features including 15-inch alloys, front fog lamps, electric folding side mirrors with indicators, cruise control, a six-speaker audio unit with dual tweeters and a leather-wrapped steering wheel and shift knob. The S Premium manual is $17,690 with a $2000 additional charge for automatic. Stepping up to the Si, available in five-door only, the Rio gains the 1.6-litre GDI engine and standard six-speed automatic along with a new design 16-inch alloy while retaining the additional comfort and convenience features the outgoing Si enjoyed over the S. This includes soft touch trim, sliding centre armrest and centre storage bin. The Si is $21,490. 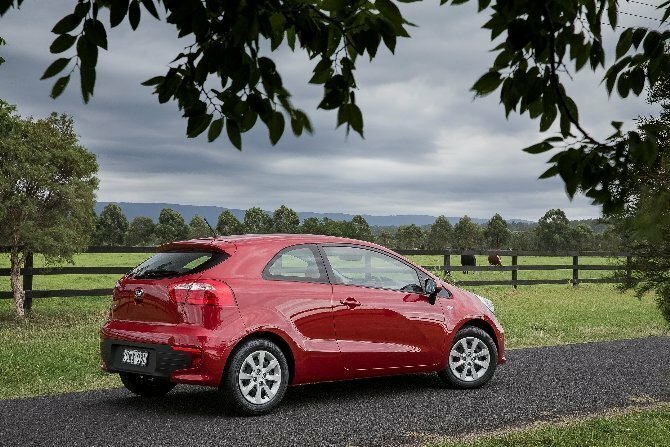 Across all grades the Rio has benefited from additional refinement of the ride and handling localization program from Kia Motors Australia. Ride comfort and control have been improved while steering feel has been moved to a new level. The upgraded Rio is available in eight colours, seven of which – Clear White, Bright Silver, Aurora Black, Graphite, Mocha, Deep Blue and Signal Red – carry over from the superseded model while there is one new premium colour, Urban Blue. The high end Sport (replacing the current SLS model) and SLi will be released later in the year. THE ever popular sporty version of the Hyundai i30, the SR, is no more for 2019, instead it's being replaced by the sporty new iN Line, designed to build on the success of i30 SR range, with upgraded performance and aesthetic enhancements.